I like it when I find an unusual, colorful, easy dish that also happens to be something I can make from items I have in my pantry. Mixing sweet and spicy with tangy pineapple and rich creamy coconut milk, this dish is a great complement to many other curries and stir-fries. 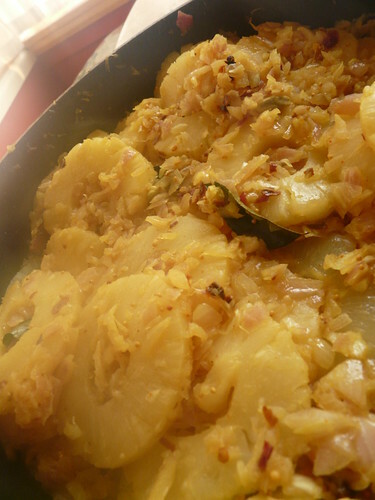 Getting a few of the spices and the coconut milk might be a challenge in some places, but once you have them this dish takes about 10 minutes to mix up, depending on how fast you can chop an onion. If you have fresh pineapple on hand, it will taste even better but it’s just fine with canned pineapple too. 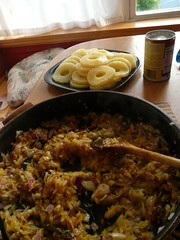 This is a curry in that it is a dish cooked on the stove with mixed spices. It doesn’t have curry powder in it – just a few whole spices, a bit of chili powder, and a coconut milk sauce to hold it all together. Cut pineapple into 3/4″ pieces or drain canned pineapple (I like the look of pineapple rings, but that’s unnecessary trouble if you’re using fresh pineapple). Heat oil in a medium pan. Add onion, mustard seeds, chili flakes, chili powder, curry leaves, turmeric, cloves, cardamoms, and cinnamon. Fry for approximately 30 seconds, stirring constantly to avoid burning. 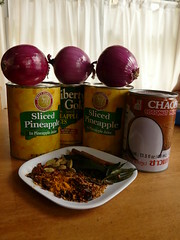 Add pineapple pieces and season to taste with salt and pepper. Cook on moderately high heat for 2-3 minutes, stirring frequently. Add coconut milk and cook for another 3-4 minutes on medium-high heat. Stir fequently and adjust salt and pepper to taste. When ready, mixture will come together. Turn off heat and let stand 4-5 minutes before serving. Serve over rice, if desired.